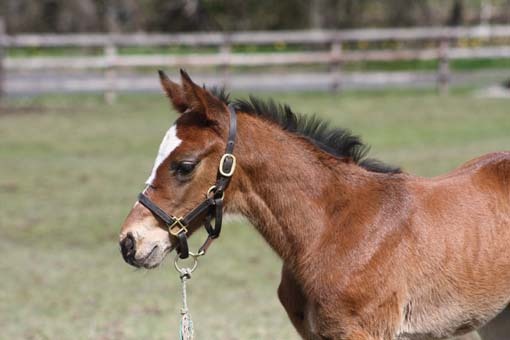 UPDATE: The Old Vic ex Miss Lloyds colt makes an eyecatching debut in a hot Punchestown Festival Bumper! Named Monte Wildhorn, after a filmcharacter, he finished 5th after getting severely hampered on the inside rails. Monte Wildhorn, a 5yo gelding by Old Vic ex Miss Lloyds, a horse that is very dear to me as I spent so much time with him, ran first time out at the last day of the Punchestown Festival. This 2m NH flat race always attracts stars of the future and this year was no exception. Vic looked a picture in the parade ring and behaved impeccably. His trainer Willie Mc Creery has clearly been doing a great job with him. The ground was cut up from all the racing and heavy. He settled well on the inside rail but unfortunately got tightened up and hampered at a crucial stage in the race. He still carried quite a lot of condition and will be much sharper next time. He should find his way into the winners enclosure shortly. Busted Tycoon, a four year old filly by Marju ex Khatela ran on the Dundalk all weather track with promise, finishing third and second on her third resp fourth start. She was shaping up like a maiden winner when she got sold to go jumping. She has started her hurdling career, trained by Tony Martin, with a couple of educational starts and looks to be well capable to win when the time is right! 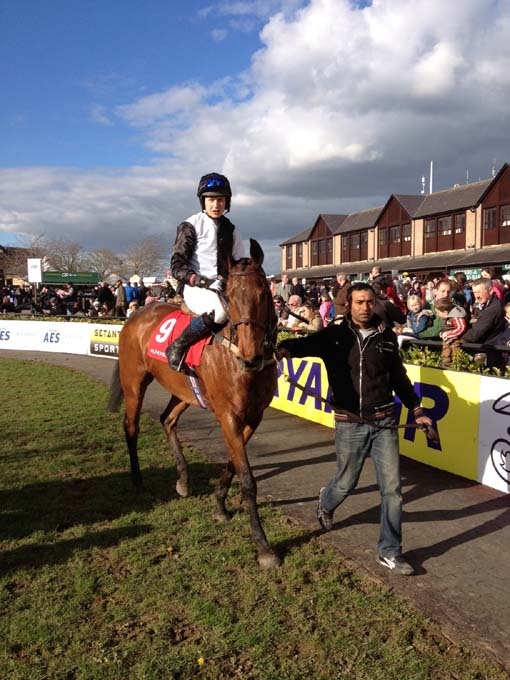 Update: Busted Tycoon wins 4yo maiden Hurdle at Tramore on Saturday! Gold Medal, a three year old half brother to Lilbourne Lad, in training with Richard Hannon had his first start at Kempton recently and could be considered unlucky not to make it a winning one. He came with a late run, but just failed to catch the winner by a short head. He would have learnt a lot from the experience and looks well capable of winning his maiden and will hopefully reward his patient owner, Mrs Julie Wood with some good performances in the future. The Mastercraftsman ex Sogno Verde filly in training at Ballydoyle with Aiden O Brien has been named Bluebell and holds an early entry for the Gr 1 Phoenix Stakes in August of this year. 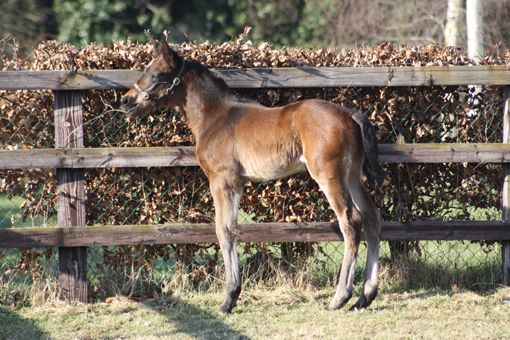 Our latest addition, a colt by Lawman ex Ezalli. 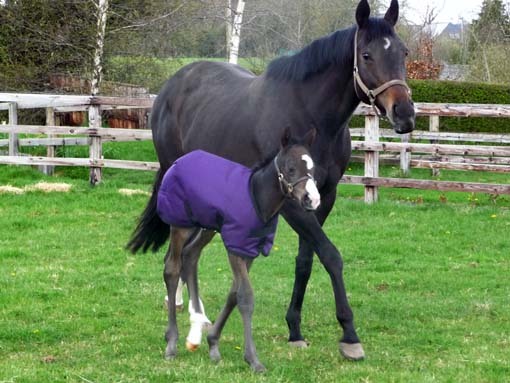 This is her first foal and she is learning how to be a mother! 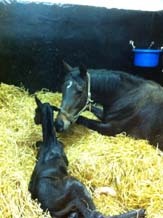 Third Dimensions Arcano colt is having a rest (left) and his relative, the Elusive City colt ex Theola is going places! Lilbourne Lad ex Nisriyna is getting more handsome by the day!